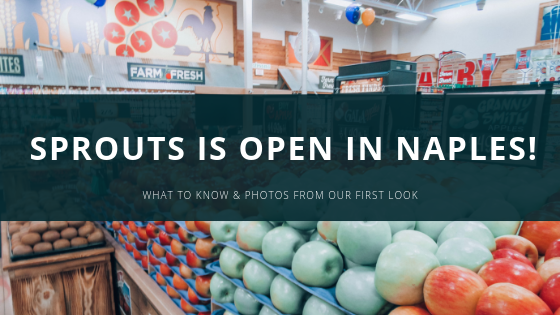 This morning the first Sprouts in Naples, FL officially opened its doors at 7:00 am! I have been so excited for Sprouts to open since I first heard about it and even more now that I got a chance to finally go inside. Last night we were invited for a first look tour during their “Family & Friends Event”. The store was only open for a couple hours specifically for this event for the employees family’s and friends. As we pulled up in the parking lot we noticed right away how full it was and the store inside even more packed but all for good reasons. The store was neately organized and full of energetic employees, all welcoming you and greeting you as you walked by. Quick insider tip, if you are curious about a product you can ask one of the friendly team members at Sprouts and they will help you find the right product to fit your needs, or help you sample a product right on the spot! Within the first minutes of being in the store we noticed the variety of foods, pre-cooked meals, fruits, snacks, deli cuts that were all fresh, natural and organic at great prices. I was also so surprised to see other flavors of gluten free, vegan products that I didn’t even know existed. Sprouts prides themselves in carrying the whole brand and all the flavors they offer. The Bulk department is another place that surprised me. I am always looking for healthy snacks, I love to snack all day long. But I also need variety and that’s why I love the bulk department. There I can get a few bags of fresh nuts, grains, oats, and granolas to last me through the week. Oh and if you’re wondering what was Emma’s favorite part of Sprouts, definitely all the fruits and the Dark Chocolate Dipped Coconut Rolls! As soon as I reminded her thats where they came from, she couldn’t stop talking about it. We had to open the bag right in the store, but thats okay, thats a snack we don’t feel guilty about! So on your next day off or next grocery store run stop by the new Sprouts to check it out you, won’t regret it! Its open 7:00 am to 10:00 pm every day! For all the ways to save at Sprouts make sure to read my blog post “Ways to Save at Sprouts“! & as always if you want to read more on the Sprouts Naples location click here.